It's hard to imagine a beautiful city like Paris covered in wind turbines but in climate change times like these, a girls got to do what a girls got to do. Paris authorities are planning to build a score of small wind turbines on rooftops across the city in line with its sustainable development efforts. 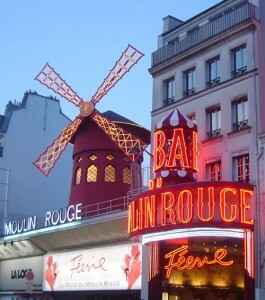 Home of the Moulin Rouge (or red windmill) the Montmartre district is one of the windiest areas of Paris and thus will be one of four neighbourhoods where the wind turbines will be focused. The turbines are 15 metres high - which is smaller than the 90 meter tall types of some wind farms. But they will go some way to helping the city reach its wind energy target of 20,000 megawatts by 2020. Efforts are also underway to determine whether water turbines under the capital's bridges of the Seine river would produce renewable sources of clean energy. But it seems the city is divided with some worried that the cities skyline will be disfigured. I guess it's a choice between nature's disfigurement and concrete disfigurement - time will only tell.